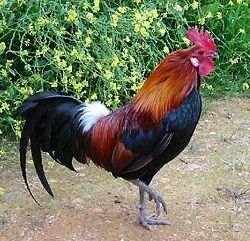 Chicken is the common name for domesticated red junglefowl that are given the scientific name Gallus gallus. They are best known for their use as poultry (domesticated farm bird). 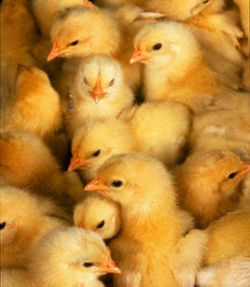 As a farm animal, they have been raised throughout history for collection of daily eggs, feathers, and meat. The hen produces a yolk, called the oocyte, from it's ovary during ovulation. After ovulation, the yolk is sent to the oviduct, and fertilized inside the hen. While in the oviduct, whether it is fertilized or not, it is covered with weird fibers and layers of the egg white called the magnus. As it moves through the oviduct it rotates because the Oviduct is a long spiraling tube. This turning of the yolk, causes the fibers, called chalazae, to twist which make the fibers hold the yolk in the thick egg white. There are fibers for each yolk, on opposing sides of the egg. The shell of the egg is built around the yolk and white in the bottom of the oviduct before it is laid. The shell is made from a crystalline form of calcium carbonate, also called calcite. The total trip taken by the yolk until being laid takes about one day. If the yolk was fertilized, the oocyte becomes the embryo, and its food is the yolk. The embryo breaths through the egg shell itself, and the inside of the egg is connected to the blood vessels of the unborn baby chick. It takes the chick embryo about 21 days to develop, and when it is fully developed the baby chick pecks it's way out of the little egg. .
Chickens are mainly omnivores and can live for five to eleven years. In one year, a hen may lay as many as three hundred eggs. All chickens have hollow bones which are used as an enlargement of the respiratory system. This makes the chicken's skeletal system small and lightweight but even though it is lightweight, it is strong. The vertebrae of poultry are fused for better flight. The chicken may be the world's most popular poultry, but there are many flaws with this bird, such as diseases. One example is the Avian Flu. This disease has been around for a very long time, but when a human caught it from a chicken, it was finally taken note of. It is a disease that is highly contagious and is most likely to have been carried by chickens and turkeys. It can be carried by a migratory wild bird, but that bird could show no signs of the disease whatsoever. This disease is something that a human rarely catches. Avian Flu caused two deaths in 2005, of two younger boys. Since the late 1990s the flu has been diagnosed sporadically. In 1918, swine flu killed over 20 million people. Experts believe that another flu pandemic could be coming in the future. Scientists who have studied this disease noticed a change in the flu that can only be found in birds, at first, that is making it compatible for humans as well. This could be a threat to people globally..
↑ SPECIES INFORMATION-CHICKENS and TURKEYS author not specified, AZ edu, 06/26/2008. Avian Flu USDA, May 9, 2008. This page was last modified on 16 August 2014, at 13:48.